Sharing your Windows internet connection via software becomes easy these days. In today's day's lots of us having at least one smartphone to access the Internet, almost all mobile phones have inbuilt WiFi adapter and also, smart OS is much popular these days. The Windows OS also have an option for creating a Wireless connection, called "ad-hoc", but as we discussed Most Common Windows 7 Issues & Solutions you got to know, the Android is unable to detect this kind of network, it further needs an "infrastructure network". Windows can turn your computer into a WiFi Access Point with Firewall that allows you to share any type of internet connection. Moreover, track all connected devices to your virtual WIFI-Hotspot. Instead of getting into those details, Learn how to turn your laptop or PC into portable wireless - WiFi hotspot free. You just need to provide a name for your network, enter a password, and choose the connection you want to share with devices that connect to that Wi-Fi network and you're done. Share any type of internet connection including LAN, Ethernet, 3G/4G Datacard or Wi-Fi. So stop searching how to turn your Windows 7/8/10 PC into a Wi-Fi hotspot and learn how to make laptop wifi hotspot quickly. Last time we have seen Firefox Booster - SpeedyFox | Quickly Make Firefox Run Faster. Today we are going to learn how to use laptop as hotspot or to turn Windows PC into Wireless Hotspot and to get faster internet. In this tutorial we are going to create a wireless connection in Windows which is also detectable for Android over WiFi. A new tool called - mHotspot is a PC WiFi hotspot software tool that creates a virtual wifi hotspot on Windows computers. There is an Internet application called mHotspot, which is a better option than getting paid for Connectify. 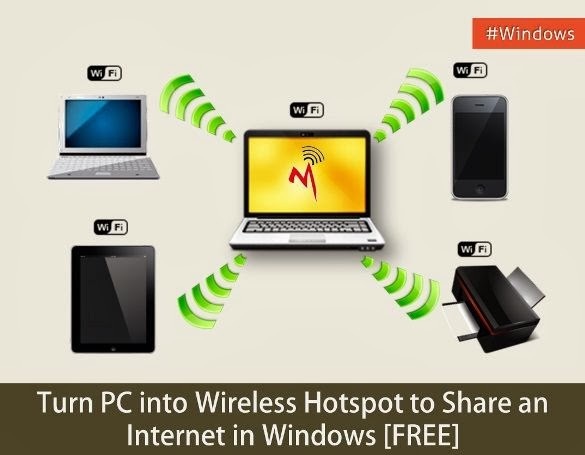 Free WiFi mHotspot is a super easy solution to turn your laptop or notebook into a portable Wi-Fi hotspot, wirelessly for sharing your any type of internet. It's a tool which is used to create infrastructure network and it is a completely free tool which helps in converting Windows 7, 8 as well as Windows 10 OS into virtual WiFi router and creates a secure WiFi hotspot. By using mHotspot, you can share internet connections including 3G/4G, LAN, Data card for all kind of devices. Even more, you can play multi-player games using such hotspot. Moreover; a laptop installed with mHotspot can act as a repeater. Yes, the laptop can increase the range of a wifi network by generating an additional wifi. The software is completely free, easy to install and use. Unlike Connectify, it doesn't disconnect every 30 minutes, so you get uninterrupted access. As for the firewall or antivirus on your computer, mHotspot doesn't get blacklisted like Virtual Router Plus. If you have that installed properly, then you can turn your Windows computer into a WiFi hotspot and share your Internet connection. Install mHotspot, run and after driver installation please RESTART [must]. Connect your internet connection first. Now open mHotspot tool. Put hotspot name and password as you want, choose connection to be share and start hotspot. Go to Change adapter setting, shown in the left-hand side menu. You will see there is Wireless Network Connection 2. Now go to properties of your chosen connection. In sharing tab, tick the box to allow other network users to connect through this computer's Internet connection. And select Wireless Network Connection 2. That's it. You can now access the shared Internet on your devices. 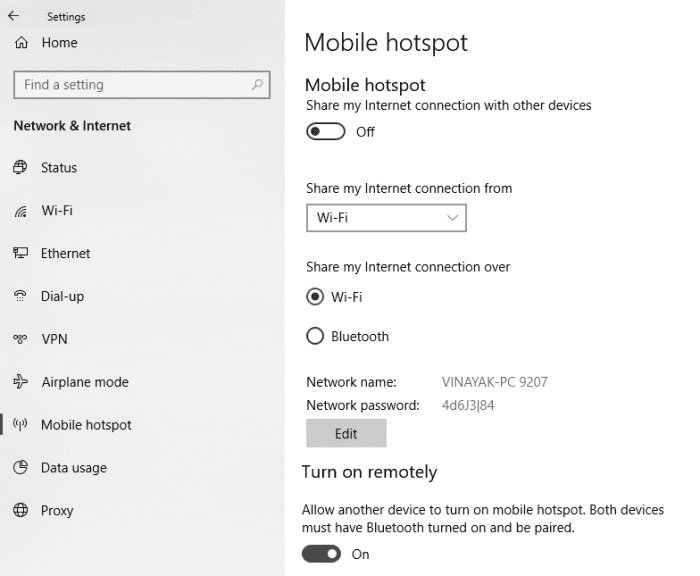 Mobile hotspot is the most convenient function made available in Windows 10 to share your (Broadband/LAN) internet connection with other mobile devices without requiring to install third-party Wi-Fi hotspot softwares. In Windows 10 Update, Microsoft has given the ability to all the users making easier to create a free mobile hotspot. Go to Settings >> Network & Internet (Wi-Fi, Airplane Mode, VPN) >> Click "Mobile Hotspot" shown on left side menu >> Turn ON the option to share your internet connection with other devices. If you get an error while activating sharing your internet connection then restart the process of Windows Firewall and set it to automatic. That is how you turn your PC/ laptop/ Android/ Ubuntu/ Windows into a Wi-Fi hotspot. Have something to add to this story? Share it in the comments, that’s how we all learn, and we’re all in this together.